For the musical based on the album, see Hadestown (musical). Hadestown is the fourth album by Vermont-based Anaïs Mitchell, and was released by Righteous Babe Records in the U.S. on March 9, 2010. The album, a concept album, follows a variation on the Ancient Greek myth of Orpheus and Eurydice, where Orpheus must embark on a quest to rescue his wife Eurydice from the underworld. It has been advertised as a 'folk opera'. Several of the songs feature singers other than Mitchell, including Justin Vernon (better known as lead vocalist and guitarist of Wisconsin-based band Bon Iver), Ani DiFranco, Greg Brown, and Tanya, Petra and Rachel Haden (referred to in the track listing as 'The Haden Triplets'). The album features orchestral arrangements by Michael Chorney, who was involved with Anaïs' recordings since Hymns for the Exiled in 2004. The recording itself is based upon a live version of the 'folk opera' which was performed by Mitchell with the collaboration of Mr. Chorney and a theatrical director, Ben T. Matchstick. These performances originally featured a 22-person cast and, after a tour of New England, the songs began to be edited and reworked. Within the narrative of the album, the part of Orpheus is played by Vernon, Persephone by DiFranco, Hades by Greg Brown, The Fates by Tanya, Petra and Rachel Haden, Hermes by Ben Knox Miller and Mitchell herself plays Eurydice. While most of the recording was produced by Todd Sickafoose at Brooklyn Recording Studio in New York City, the lead vocals were often produced elsewhere in the U.S.. The Grammy Award nominated packaging was designed by Brian Grunert, Peter Nevins and Anaïs Mitchell, using the artwork of Peter Nevins. As the album begins, "Wedding Song" describes the courtship of Orpheus (Justin Vernon) and Eurydice (Anaïs Mitchell). Living in a time of economic depression, she asks him how he can possibly afford to marry her and give her a good life, to which he replies that his musicianship will bring them everything they desire. Although she loves Orpheus, Eurydice seems wary and unsure whether he can provide for them. Orpheus then sings of how Hades built his empire in the underworld, using exploitation and trickery to force the residents to do his bidding ("Epic Part I"). Hermes (Ben Knox Miller) visits Eurydice and teaches her how to get to Hadestown, telling her it is a world full of prosperity and far away from the poverty she fears. She seems convinced although Orpheus tries to change her mind by making Hadestown out to be full of slavery and unending work. He is drowned out by Persephone (Ani DiFranco), who sings of the coming end of summer when she will be taken back to the underworld to reunite with her husband, and The Fates (The Haden Triplets), who sing of the luck that comes from living in Hadestown. Eurydice begins to question her quality of life and considers journeying down ("Way Down Hadestown"). In "Hey, Little Songbird" Hades himself (Greg Brown) calls to Eurydice and lures her onto a train down to his domain in the underworld. Eurydice apologises for leaving Orpheus, saying that she allowed her gut feelings to overrule her heart. She tries to excuse her decision by telling him that she was gone as soon as she met Hades and nothing could have stopped her from leaving ("Gone, I'm Gone"). The Fates chastise the listeners for judging her from their life of comfort. They then pay a visit to her and ask her what she is going to do when forced to make another tough decision ("When the Chips Are Down"). Orpheus is determined to rescue his love from Hadestown but Hermes warns him that it will be a difficult task to accomplish but gives him advice about how to survive the journey and shows him to the train ("Wait for Me"). Meanwhile, Hades reinforces his power over the underworld by manipulating its residents into believing that, although they must work tirelessly to do Hades' bidding, the outside world is much worse. Therefore, Hades is able to seem as if he is a benevolent ruler who is, in fact, protecting his people rather than enslaving them ("Why We Build the Wall"). Orpheus travels through Hadestown and comes across a speakeasy run by Persephone. Instead of alcohol, Persephone offers earthly desires (such as rain, wind, stars and sunlight) to her customers. When he enters, Persephone takes a liking to him ("Our Lady of the Underground"). In "Flowers", Eurydice, who has now become Hades' mistress, realises what a terrible mistake she made being tempted by his wealth and power. She regrets leaving Orpheus, the only man who ever loved her, to live with a cruel tyrant and expresses her wish to being reunited with him. The Fates pay Orpheus a visit and try to persuade him to abandon his quest to rescue Eurydice, telling him there is no chance he will succeed and trying will only bring him pain ("Nothing Changes"). Their words trouble him and he begins to wonder if he will ever see his true love again ("If It's True"). Hades, having discovered that Orpheus is trying to save Eurydice, sympathises with their plight, for he loves his own wife in the same way that Orpheus loves Eurydice. He is afraid that allowing the couple to reunite and leave the underworld would make him look weak and would cause his power over Hadestown come under threat. Persephone, knowing her husband will never give in to his humanity without encouragement, convinces him to be kind and put the love of Orpheus and Eurydice over his own greed ("How Long?"). When Orpheus finally reaches Hades, he appeals to him to let Eurydice go. Doing so in front of his wife and subjects forces Hades to grant the request, as refusing would reveal his true heartless nature ("Epic Part II"). Hades devises a plan to ensure that he maintains control of the underworld without looking weak by making a deal with Orpheus: the lovers are permitted to leave Hadestown together so long as Eurydice follows Orpheus and he does not turn around ("His Kiss, the Riot"). As they journey back to the surface together, doubt begins to plague Orpheus. The arrogance and confidence that filled him when he began his quest are lost and replaced with fear because he is unable to see Eurydice and does not know if she is truly following him. As they walk Eurydice tries to reassure him that she loves him but, after her initial betrayal, Orpheus does not believe her and turns ("Doubt Comes In"). In the album's closing track, "I Raise My Cup to Him", Eurydice, doomed to remain in Hadestown forever, finds herself in Persephone's bar where they both lament the loss of love and raise a toast to Orpheus, who was forced to return to the surface alone. Upon release, Hadestown gained extremely positive reviews overall. Drowned in Sound awarded the album a rare 10/10, stating that "Mitchell traverses such a sweeping range of emotions, genres and styles over the course of Hadestown, it’s frankly remarkable that the whole thing works at all. That it works so brilliantly well, that in under an hour it creates a world you’ll want to return to time and time again, that it is a glittering model of the form – of collaboration itself – is nothing short of awe-inspiring." The Guardian and NME were similarly effusive in their praise, awarding the album 5/5 and 9/10 respectively. Stereo Subversion's Jonathan Sanders gave the album a perfect score and called it "a lasting example of where folk music can go when the right musicians take hold of history." The album also topped review aggregator website AnyDecentMusic? 's all time chart with an 8.9, the highest rating for any album until Frank Ocean's Channel Orange. "Why We Build the Wall" was later covered by English country folk musician Billy Bragg on his 2018 album Bridges Not Walls. In 2017 it was ranked number 63 in Paste magazine's "The 100 Best Indie Folk Albums"..
Mitchell continued working on an expanded theatrical version of Hadestown, and in May 2016 the show debuted at New York Theatre Workshop, having been developed with and directed by Rachel Chavkin. In November 2017, the show received its Canadian Premiere at The Citadel, Edmonton, and in April 2018 it was announced that Hadestown would open later the same year at London's National Theatre before transferring to Broadway. ^ Anaïs Mitchell, Weinland Creative (2010-03-09). "Anaïs Mitchell Website". Retrieved 2010-05-03. ^ music allies (2010-03-09). "Anaïs Mitchell Press Release". Archived from the original on 2010-03-17. Retrieved 2010-05-03. ^ "Anaïs Mitchell: Hadestown". anydecentmusic.com. AnyDecentMusic?. Retrieved 29 May 2018. ^ "Anais Mitchell Hadestown – CD Review of Anais Mitchell Hadestown". Folkmusic.about.com. Retrieved 2012-02-20. ^ Jurek, Thom (2010-03-09). "(Hadestown > Overview)". allmusic. Retrieved 2010-05-03. ^ "Music – Review of Anaïs Mitchell – Hadestown". BBC. Retrieved 2012-02-20. ^ a b Skinner, James (2010-04-23). 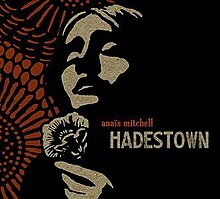 "Anaïs Mitchell – Hadestown/Releases/Releases//Drowned in Sound". Retrieved 2010-05-03. ^ Hann, Michael (2010-04-22). "Hadestown CD Review". London: The Guardian. Retrieved 2010-05-03. ^ Snapes, Laura (2010-04-26). "Anais Mitchell: Album Review". New Musical Express. Retrieved 2010-05-03. ^ Spencer, Neil (2010-04-25). "Anais Mitchell: Hadestown". London: The Guardian. Retrieved 2010-05-03. ^ a b Sanders, Jonathan (2010-03-31). "Anaïs Mitchell – Hadestown (review)". Stereo Subversion. Retrieved 2013-07-14. ^ Cairns, Dan (2010-04-25). "Anais Mitchell Hadestown". The Times. London. ^ a b "Hadestown by Anaïs Mitchell reviews". Any Decent Music. Retrieved 2012-02-20. ^ "The 100 Best Indie Folk Albums". Paste. Retrieved 11 October 2018. ^ "NYTW / Hadestown". NYTW. Retrieved 2018-04-25. ^ Paulson, Michael (2018-04-19). "The Underworld Will Stop in London en Route to Broadway". The New York Times. ISSN 0362-4331. Retrieved 2018-04-25. This page was last edited on 23 April 2019, at 02:51 (UTC).